The hottest technology in energy efficient HID lighting is now available from Nanolux Technology Inc. Ceramic Metal Halide, or CMH for short (some refer to it as CDM), is becoming more popular in the horticultural industry. The CMH lamps have a very broad light spectrum which is more similar to the sun itself than any other form of HID lamp. We have taken CMH technology and increased its operational efficiency, making the most comprehensive spectrum of light output for an HID fixture even better. The CMH lamps also have increased efficiency in AR/Watt compared to other forms of HID lighting. The CMH fixture can be used as a primary veg light; a primary light for SOG applications; or a supplemental full spectrum light for large flowering operations. CMH 315 Single Lamp Fixture vertical mounting position provides an even-light footprint. Can be used with any 315W 3K or 4K horticultural CMH lamps from all leading quality brands. Fully sealed commercial designed ballast. 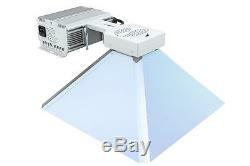 Uses 315W PGZX18 base CMH lamps. Input Voltage: 120/240V Input Frequency: 50/60Hz Amperage Draw: 2.6/1.3A PF: >0.99 THD: <1.7 Weight: 5.9 lbs Fixture Dimensions: 16.5X16.5X12.6. 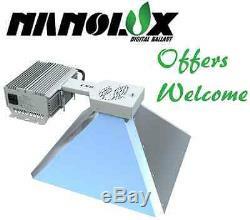 The item "Nanolux 315w CMH Ceramic Metal Halide 120v/240v (Fixture Only)" is in sale since Monday, May 01, 2017. This item is in the category "Home & Garden\Yard, Garden & Outdoor Living\Gardening Supplies\Hydroponics & Seed Starting\Grow Light Kits". The seller is "seattleshydrospot" and is located in Petaluma, California. This item can be shipped to United States, Canada, United Kingdom, Denmark, Romania, Slovakia, Bulgaria, Czech republic, Finland, Hungary, Latvia, Lithuania, Malta, Estonia, Australia, Greece, Portugal, Cyprus, Slovenia, Japan, China, Sweden, South Korea, Indonesia, Taiwan, South africa, Thailand, Belgium, France, Hong Kong, Ireland, Netherlands, Poland, Spain, Italy, Germany, Austria, Russian federation, Israel, Mexico, New Zealand, Philippines, Singapore, Switzerland, Norway, Saudi arabia, Ukraine, United arab emirates, Qatar, Kuwait, Bahrain, Croatia, Malaysia, Brazil, Chile, Colombia, Costa rica, Panama, Trinidad and tobago, Guatemala, Honduras, Jamaica.